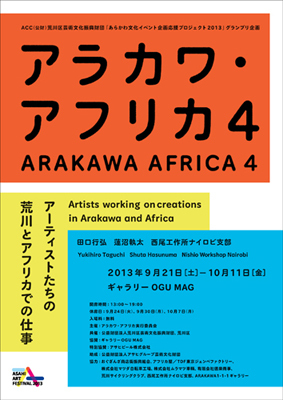 Arakawa Africa is a comprehensive annual art event in Arakawa ward, Tokyo, consisting of exhibitions, residency programs, artists talks, etc. This year we invite three artists who have recently completed their stay in Africa. Though Arakawa and Africa are very far away from each other, they have a lot in common in terms of scenery, people and many other perspectives, if you are to indulge your imagination. Arakawa Africa aims at identifying those African elements that exist in Arakawa, through the lens of contemporary arts, imagining Arakawa to be adjacent to Africa, and enhancing cultural potential and capacities of each region, together.